For Christmas this year I declared very seriously that I wanted an orange Kitchen Aid mixer and nothing else. My brother (and mother) verifyed the color with me at least 15 times (and still call and make sure that is in fact the color I wanted), but I was stead fast in my decision. Sitting in my kitchen next to the cutting boards and granola bars now rests a Kitchen Aid that I'm sure drives my roommates nuts with it's cheery tangerine color, but I love it. I've used it twice so far and I'm still giddy thinking of all the amazing treats I'll make with it. My first creation was GIANT homemade Oreos and my second, last night, we're Old Fashioned Sugar Cookies. My friend Steve recently purchased a house a couple miles from my apartment that has a massive lemon tree in the backyard. The previous owners let it run wild and it's fruits are scattered all over the backyard and driveway. I could barely contain myself when he told me I was welcome to pick as much lemon as I wanted, and that I was welcome to go and pick it whenever. Picking lemons by the light of your headlights at 10 o'clock at night when the home owners are away is surprisingly adventure-like, by the way. 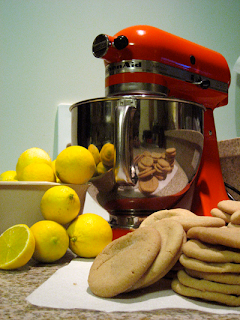 Old Fashioned Sugar Cookies use lemon instead of vanilla for their flavor, which is one of the reasons I selected that recipe. My roommate, Ben, thinks that by now I should be lemoned out with all the lemon based recipes I've been making, but I proved him wrong last night when he tasted the final product to find them very un-lemon like. I'm sure when Ben first moved in with me he had no idea that he would be my official taste tester, forever sampling dough and frosting from a spoon while he tries to play Xbox. I don't hear him complaining, mind you, I just think he wasn't expecting such a pleasant assignment. He takes it very seriously, though, making sure to give as honest feedback as he can while he downs his twelth cookie. The good news is that that twelth one tastes just as good as the first, you know, in case I was wondering. Next on my Lemon List is Lemon Hard Candies and Lemonade, both of which I'm sure Ben will be more then willing to try. The good news is that when I do finally get over my obession with lemons, Steve has an orange tree right next to the lemon that's just as overgrown. Just think, they'll match my mixer! They look awesome, did you find the recipe online? BTW I love love love your orange mixer..I have the old white one LOL and would love a pink one but now that orange is about way cool!